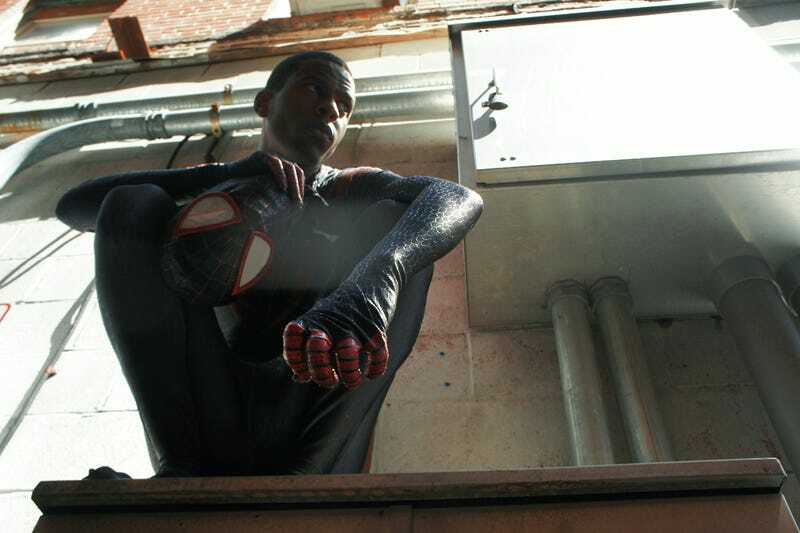 Miles Morales is finally getting some time in the spotlight lately thanks to the news he'll be showing up in Marvel's Ultimate Spider-Man cartoon, but this amazing cosplayer's photo shoot as the young hero has us yearning for Miles to get his own movie. Nikolas Draper-Ivey is an illustrator, model and cosplayer whose been setting the internet on fire over the past few days with his spot-on recreation of the Ultimate Spider-Man. Draper-Ivey plans to take the cosplay on the road with him to New York Comic-Con later this year, but for now we get to see his work in its full glory in this brilliant set of photos posted to his Tumblr. In just a handful of images he captures Miles's demeanour as a younger Spider-Man excellently, but the devil is in the details in his 'cinematic' take on Morales' Spider Suit. There's a few cues from the suit seen earlier this year in The Amazing Spider-Man 2, especially the subtle texture in the suit's material, but it's also a great realisation of the comic book suit. Come on Sony, Marvel, whoever it takes - if a fan can make Miles look this good, surely you can do better and give him a movie! Check out more photos of Nikolas in action, as well as some of his own art, at the link below.